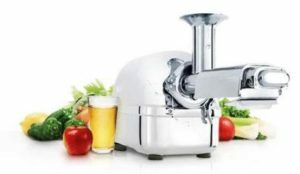 The Super Angel Twin Gear Juicer is 100% stainless steel for the best juicer in the world – and I can say that without qualification because it is true. The only thing that may be a little better solely in terms of juicing efficiency is a $2,500 Norwalk “juicer,” which is really a “juice press” and is pretty tedious and messy to use. This Super Angel’s all stainless steel design combines with the most advanced twin-gear technology to give you the best juicer in the world by any measure! Juicing efficiently means you get more juice – as much as 20-50% more than other juicers. Which means you get much drier pulp. And of course, less foam. That means they have a longer warranty – a full 10 years. And you can be sure it will last even longer than that! Super Angel Juicers re-invented the twin gear design from scratch — you’ll never see another twin gear design like this — developed to be the most efficient in the world designed just for the most powerful masticating juicer available! 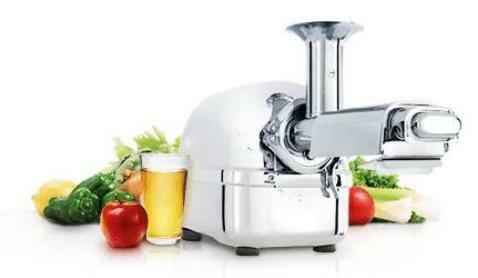 A full 3-housepower motor drives powerful gears that are almost twice as long as most other twin-gear juicers, slowly and powerfully squeezing every drop of juice out of your organic fruits and veggies for the most cost effective juicer you can buy. Super Angel Twin Gear Juicer “masticates,” or chews your fruits and veggies at the ideal speed – 82 RPM – slowly squeezing the juice out to minimize oxidation and friction/heat to keep all enzymes and nutrients alive in the juice. It will also make baby food, nut butters, ice cream, etc. 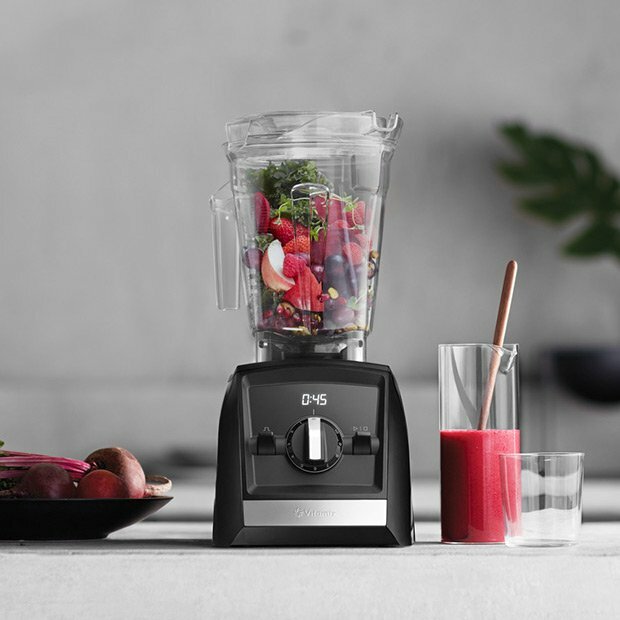 like other multi-purpose juicers, but more efficiently and with less oxidation! The Super Angel is the world’s most efficient and amazing fruit, vegetable and wheatgrass juicer. Extract juice from celery, carrots, parsley, spinach, wheatgrass, apple, kale, cucumber, ginger, sprouts and any leafy greens! It can also extract from less obvious things such as pine needles and aloe. The low 82 RPM speed protects flavors and high nutritional content from being destroyed by heat and oxidation. No plastic, nylon, Lexan or other polycarbonate materials come into contact with your food! The state-of-the-art stainless steel design is always easy to keep clean and hygienic! OPTIONAL: Get the Super Angel Premium Deluxe model for the best steel in the world – 316 Surgical Grade Stainless Steel Extractor Housing & Gears (select on checkout). This low rotation speed is ideal for getting the highest quality and most nutritious juice. The slow speed produces little oxidation and heat, which keeps more enzymes intact. 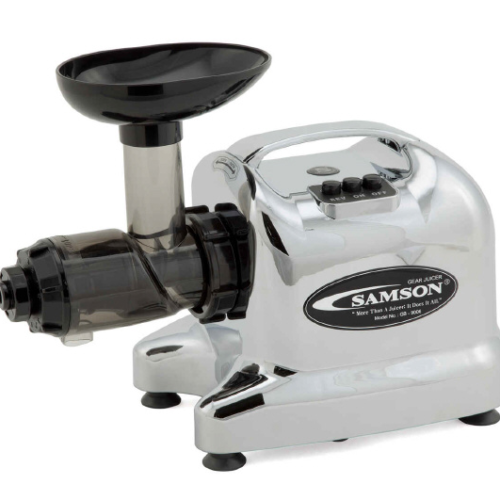 The Super Angel Juicer is the lowest rpm twin gear juicer in the market! But just because it rotates slowly does not mean that it makes juice slowly. 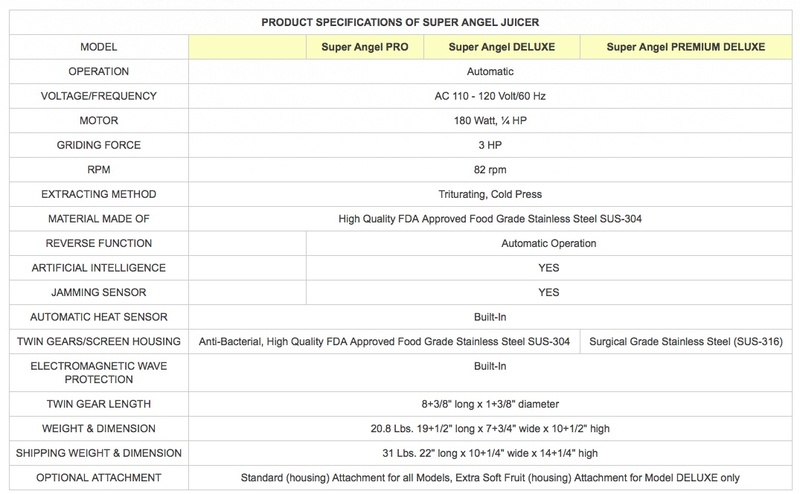 The Super Angel makes juice quickly, plus you get higher juice yield and drier pulp! The solid, surgical-grade stainless steel twin gears provide 3 horsepower of power that allows it to break down tough plant cell walls and release the nutrients locked witin. The high pressure squeezing and masticating action makes it possible to juice strong fibrous, stringy fruits and vegetables quickly and easily, such as wheatgrass. You’ll enjoy richer color and more full-bodied flavor. 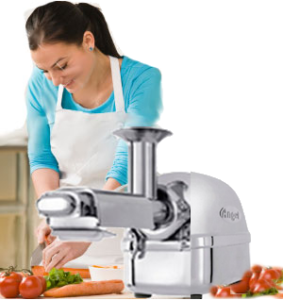 Design for maximum extraction efficiently, stage one thoroughly crushes, chews or grinds your fruit and vegetables. Stages two and three appliy concentrated pressure while continuing to “chew” your fruits or vegetables creating very dry pulp and as a result – more, healthier juice. The twin gears in the Super Angel are bigger and longer than any other twin gear juicer on the market – and are a unique design optimized for the highest juicing efficiency ever!. The Super Angel’s 3-stage juicing screen filters and maximizes your juice yield, resulting in 3 times the amount of juice extracted compared to other juicers. 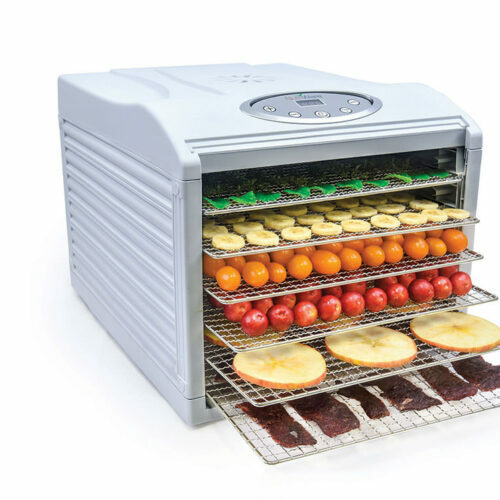 A single three-stage screen handles fruits, vegetables, and leafy greens. There simply is no need for other screens. Amazingly powerful yet easy and simple to use and clean. Its newly designed parts make clean-up, assembly and disassembly a snap. The powerful heavy duty motor always brings maximum squeezing force and produces the highest quantity of juice. There’s no need for adjustable nozzles or switching to different nozzles. The twin gear system allows continuous juicing without having to remove pulp. The twin gears remove more than 90 % of agricultural chemicals and toxic substances from the surface of fruits and vegetables. Angels higher wattage motor features a unique cooling system for less strain on the motor, less heat buildup, and increased durability. 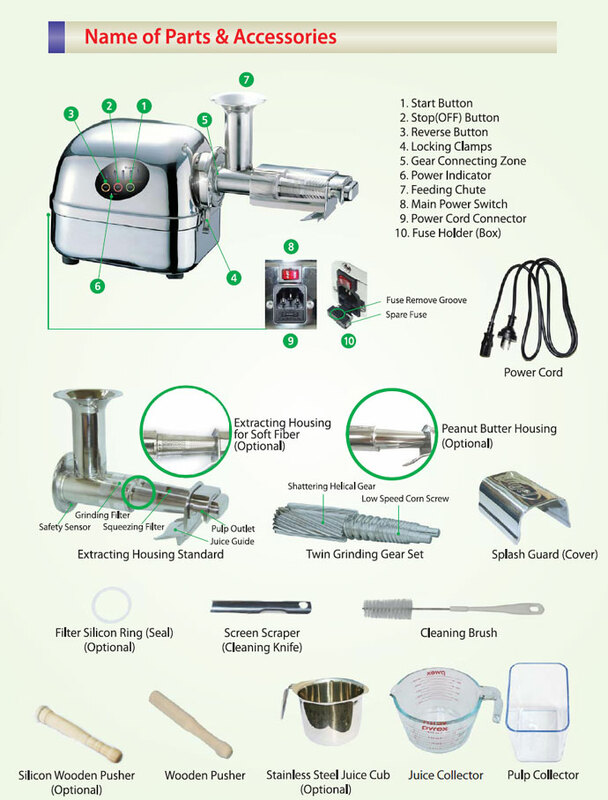 The Super Angel Juicer will extract juice from almost anything from carrots and apples to wheatgrass and pine needles. Also make delicious soy milk, tofu, meat pate, frozen fruit sorbet, baby food and even nut butter! A thermal protection device and anti-jamming automatic reverse offer safe use and peace of mind. The automatic motor thermostat prevents the motor from overheating. Automatic Heat Sensor, Extra Rocker Switch, Internal Gear Protection, Reinforcement of Switch Panel, Double Protection of motor and Main Housing Unit, and Screen Housing. The Super quiet cooling fan prevents motor overheating. The ultra-precision 2-stage twin gear system combined with the powerful heavy duty motor bring the maximum juice extraction possible. You’ll see the difference in the extremely dry pulp when compared to other juicers. Hand-built, precision engineered featuring the highest quality grade stainless steel available. Advanced Design Unique to the Super Angel Twin Gear Juicer! Super Angel’s solid stainless steel twin gears features Shattering Helical Gear Technology. Invented by Angel with 30 years of experiences, these advanced gears literally crush plant fibers into fine particles for extracting the nutrients hiding deep inside of the cells. You can easily see how finely the fibers are ground by the more advanced Super Angel gear design. Just put some pulp into a cup of water and look at the fibers in the water. As you see on the right, the Super Angel’s gears grind the fibers evenly and break the fiber cells of produce, resulting finer particles and extracting more of the the nutrients hiding deep inside the cells. Other brand twin gear juicers can’t match the Angel’s ability to crush the fiber cells of your veggies like this! In a test report prepared by KAFRI (Korea Advanced Food Research Institute) the Super Angel can extracted almost 3 to 7 times more nourishing, nutritious juice than other brands and about 20 to 30 percent more juice. Super Angel Twin Gear Juicer features a 3-stage twin gear system for efficient juice extraction. Stage one applies concentrated pressure to fruits or vegetables. Stages two and three grind and continuously process fruits or vegetables, producing very dry pulp and as a result – more, healthier juice. In addition to the three-stage twin gear system, the Super Angel’s three-stage screen filters can maximizes pure juice yield resulting in almost 20 to 30% more juice extracted compared to other juicers. The twin gear system of the Super Angel can extract essential nutrients even from fiber with a size of 5 micron. The essence of juice extraction is to obtain the best nutrients from plants. The gap between the twin gears of the Super Angel Juicer is only 0.1mm, making it possible to extract minute nutrients by crushing the micron-sized particles. Super Angel Twin Gear Juicer’s exclusive twin gear design minimizes the loss of nutrients through the unique triturating twin gear featuring an impeller press system with a low 82 rpm speed generating virtually no heat while thoroughly crushing your fruits and vegetables at the cellular level. The Super Angel Juicer’s slow speed motor prevents oxidation and maintains nutrients and enzyme activity. Keeping more enzymes intact because of less heat and friction. A low-speed rotation system of just 82 rpm preserves almost all the enzymes & nutritional benefits available. In other juicers, nutrients & enzymes in the plants are easily destroyed by frictional heat. The Super Angel features the lowest speed of any twin gear juicer. The large gears of the Super Angel are over 8+3/8 inches long and unlike others they have no plastic parts, being made entirely of food grade stainless steel (or optional surgical steel). The precision engineering involved in manufacturing these gears offers the ultimate in breakdown of fruit and vegetable fibers and delivers the best possible nutrient extraction. They are a pair of high quality food grade (or surgical grade) stainless steel, horizontal twin gears spaced at a mere 0.1 mm (4/1000 of an inch) apart. There are no blades, rotors or augers. The powerful triturating action of the twin gears crush, grind and juice almost all vegetables, leafy greens, sprouts, wheatgrass, etc. The Super Angel ‘s gear system is the first extractor gearing system awarded with U.S. patent rights and is the winner of 3 international awards. Centrifugal juicers work at extremely high speeds, can be noisy, produce a lot of heat and expose juice to a lot of air. Heat and oxidation from air will damage enzymes and nutrients. The one advantage of a centrifugal juicer is lower cost. If that’s an issue then buy a centrifugal juicer because ANY FRESH JUICE IS BETTER THAN NO JUICE. But keep in mind that a masticating juicer eventually pays for itself! You see, a typical masticating juicer requires less vegetables because it squeezes out more juice than a centrifugal juicer. I recommend single-auger juicers because of their simplicity, ease of use and the fact that you can clean them in minutes! It’s also nice knowing I’m getting the most from my expensive organic vegetables! Did you know that apples are usually sprayed around 22 times before they reach the store? Or that commercially grown carrots are often used as a crop to “clean” the soil? Do you know where your potatoes, oranges and tomatoes have been? Unless your fruits and vegetables are organic, they grew up in fields soaked in pesticides and herbicides. Although pesticide residue on fruits and vegetables are considered by the government to be at safe levels for human consumption, do you really want those extra chemicals in your food? Twin gear juicers get rid of about 80 to 90% of toxic agro-chemicals and heavy metals from produce. This is one of the reasons we recommend that you choose a Super Angel! And always be sure to buy organic produce for juicing unless you want a cocktail of chemicals in your food. The Super Angel’s Twin Gears have the ability to remove a high level of agricultural chemicals and heavy metals through the triturating and squeezing process. You see, the affinity of the fiber for agricultural chemicals and heavy metals is so high that they remain with the fiber and are discarded. Still, it’s always good to wash your fruits and vegetables before you eat or juice them. 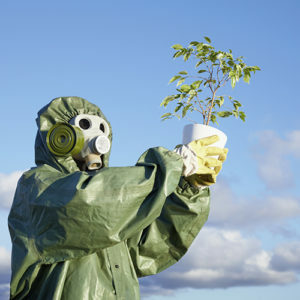 Pesticides used in the production of most crops in the United States may increase your risk for cancer or other chronic diseases and should be limited in your diet. To minimize your exposure to pesticides, buy as much organic produce as possible, wash all fruits and vegetables with water Before eating apples, cucumbers, potatoes or other produce in which the outer skin or peeling is consumed, scrub with a brush. Throw away the outer leaves of leafy vegetables, such as lettuce and cabbage. Peel and cook when appropriate, although some nutrients and fiber may be lost when produce is peeled. Once your fruits and vegetables were ready for harvest, they were handled by several different pairs of hands in the fields and orchards, then in the warehouses and finally again in your grocery store. 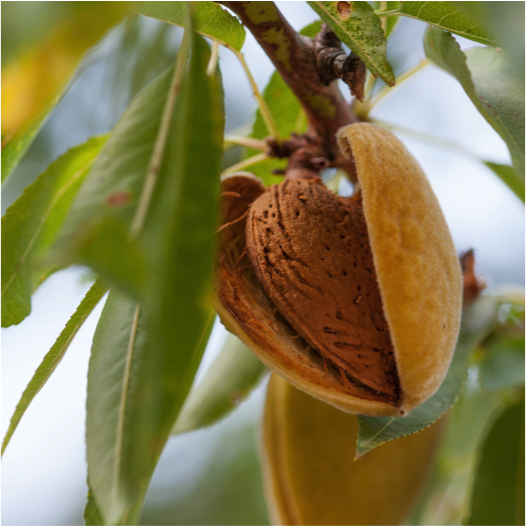 Listeria, Salmonella and E. Coli may all be lurking there, whether they’re organically grown or conventionally grown. You need to get those fresh fruits and vegetables in your diet, but not the insects, chemicals and bacteria that come along with them, so make sure you wash your fruits and vegetables before you eat them. Start by keeping your kitchen counter tops, refrigerator, cookware and cutlery clean. 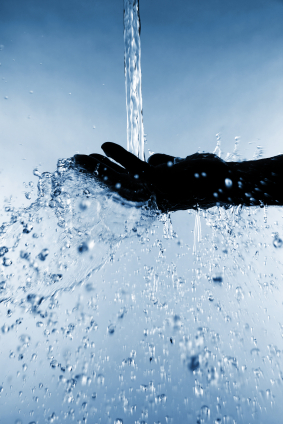 Always wash your hands before preparing meals and handling fruits and vegetables. Keep fresh greens, fruits and vegetables away from uncooked meats to avoid cross-contamination. Choose healthy looking, ripe fruits and vegetables when you shop. Avoid bruised, moldy and mushy produce. Wait until just before you eat or prepare your fruits and vegetables to wash them. Fruits and vegetables have natural coatings that keep moisture inside and washing them will make them spoil sooner. Wash all pre-packaged fruits and vegetables, even if the label claims they are pre-washed. Wash all parts of your fruits and vegetables, even if you don’t plan on eating the rind or peeling. Bacteria living on the outside of oranges, melons and squash can be transferred to the knives that cut them and then straight to the parts that you will be eating. Gently rub fruits and vegetables under running water. Don’t use any soaps, detergents, bleaches or other toxic cleaning chemicals. These chemicals will leave a residue of their own on your produce. Firmer fruits and vegetables like apples and potatoes can be scrubbed with a vegetable brush while rinsing with clean water to remove dirt and residue. Remove and discard the outer leaves of lettuce and cabbage heads and thoroughly rinse the rest of the leaves. Rinse berries and other small fruits thoroughly and allow them to drain in a colander. Click here to download the Super Angel Manual. Auto Reverse Turning Safety Features : Easily clear the foods if overloaded or jammed. Safety Sensor Device: The motor does not run when the gear housing is not attached to the motor base unit, even though the main (red rocker) switch is ON. Dual Switch Systems: The main (red rocker) switch is located on the back of the juicer (motor base unit) and controls the soft switch panel located on the side of the juicer (motor base unit). Automatic Overheat Sensor: A thermal protection device and anti-jam action offer safe use and peace of mind. The automatic motor thermostat helps prevent the motor from overheating. 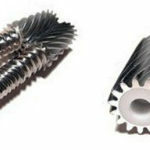 Motor Gear Protection : In order to protect the motor from any unexpected and sudden stops from the twin gears because of accidental insertion of knife, fork, metal stick, chop stick, wooden piece, etc into the feeding chute, the speed reducer gear intercepts the impact from sudden stops before it reaches the main motor gear. Please note: Do not put knife, fork, metal stick, chop stick, wooden piece or any other metal objects into the feeding chute under any circumstances. Above objects give fatal damage to Twin Gears, Motors & Screen Housing and warranty will not be provided for above incidents. Reinforcement of Soft Switch Panel: double protection around the switch panel prevents any electric shocks. Electromagnetic Wave Protection: The main circuit board is equipped with an electromagnetic wave protection system to minimize any chances of electromagnetic waves possibly generating from the motor. Manual (Plus model) or Automatic (all other models) reverse to clear jams easily. In order to get the best results from your Super Angel, juice a small amount of food at a time — never a whole bunch! A small quantity of food is more easily and efficiently crushed between the rotating gears. Also, the two gears can crush cellulose fibers more easily, breaking up cells in vegetables and fruits thus extracting the nutrients locked inside — minerals, vitamins, enzymes, amino acids and complex carbohydrates. If you insert too much food into the chute the two gears will not be able to break up the individual cells as well. Too much food at one time can also damage the extracting screen housing and cause jams because the motor runs only at 82 rpm. Insert your food little by little, rotating between hard, soft, juicy and leafy vegetables. It’s best to cut your food to an appropriate size to fit into the chute due to its small in diameter. Right after juicing, always clean the surrounding area (white bushing) of motor shaft (where the gears go in). Just spray some water on the white bushing around the motor shaft while lifting the back of the juicer a bit so that the water doesn’t get inside of the white bushing. Do not scrub the bushing with a brush or towel. Then just dry any water around the bushing by gently tapping with soft towel so you don’t damage the little o-ring at the center of the bushing. After juicing several carrots you will get a feel for how much pressure you need to use with the pusher. The slowly rotating gears can’t grab carrots easily, so use moderate pressure but not too much. You will need to cut larger carrots to fit into the feeding chute. As long as the diameter of the carrots the chute, all you need to do is cut them to about 5 to 6 inches in length. For large diameter carrots, it will be a lot easier to split them in half lengthwise. Please insert only one piece at a time, waiting for each piece to be crushed completely. Please remember that the motor doesn’t work without the extracting housing attached and locked in with the clamp. In order to protect the sensor (magnet) at the bottom of the housing, do not submerge it in water. Just clean the sensor area under the faucet, but don’t soak it in the sink. It is OK submerge the screen of the extracting housing in water. To prevent overheating, rest for ten minutes after you use the juicer for thirty minutes. Also, make sure the fan is working properly. The motor is equipped with an automatic heat sensor to protect it from over heating. If the motor gets too hot,the thermostat will stop the motor. When the temperature of the motor drops down it will start working again. Always check the hole of the screen to see if they’re clogged by calcium/mineral deposits from your produce. Clogged holes cause the yield ratio (amount of juice) to fall. You can check the holes under a light. To clean the holes of the screen soak the screen (not the sensor area) in a mixture of baking soda and water over night (2 parts soda to 8 parts water). This loosens the scaling so most of it can be brushed off with bristles. For better results, spray extra baking soda onto the screen while brushing with a brush. Remember NOT to soak the sensor area of the screen housing in water. Soft fruits can be a bit of a challenge because they can clog the holes of the screen with mushy pulp. When juicing citrus, strawberries, grapes and even cucumber take the time to cut the food into small pieces and feed them into the chute slowly. It is generally recommended to avoid soft fruits entirely since they generally have too much sugar for most people. When backed up just press & hold the reverse button for 3 to 5 seconds until the back-up clears (Plus model only). Remember to use the wooden pusher with silicone o-ring as opposed to the standard one to avoid splashing. You can minimize juice back up by alternating between soft fruits and carrots while juicing. Silicone o-rings are provided to seal the edge of the large mouth of the extracting screen housing, minimizing leakage from the lower clamp. The silicone ring is mostly needed for soft fruits, not so much for vegetables, leafy green, etc. If you juice soft fruits often, we recommend getting the soft fruit screen housing (optional). This is the same size and shape as the standard housing but has bigger holes on the screen. With the soft fruit screen housing however, you could get a small amount of pulp in the juice. Vitamix Ascent Blenders – the Most Powerful for Your Own Kitchen!